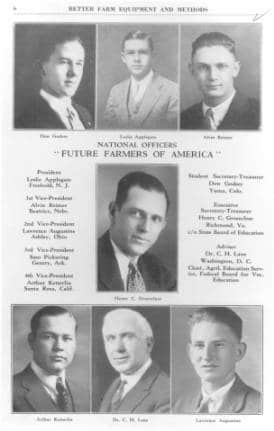 Future Farmers of America is established in Kansas City, Mo. First National FFA Convention is held in Kansas City, Mo. : 33 delegates from 18 states (Arkansas, Arizona, California, Colorado, Idaho, Iowa, Kansas, Michigan, Nebraska, New Jersey, North Dakota, Ohio, Oklahoma, Oregon, South Carolina, Utah, Virginia, Wisconsin) are in attendance. Leslie Applegate from New Jersey is elected first national FFA president. First sectional gathering of New Farmers of America (NFA) members is held.